Handbook on ICT in Developing Countries: Next Generation ICT Technologies is the second volume of the Handbook of ICT in Developing Countries. 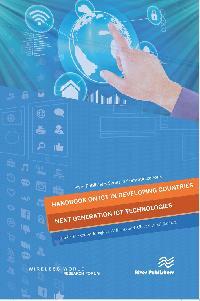 The first volume was on the potential implementation and service delivery of the forth-coming 5G networks. Here the focus is on the new technologies and services enabled by 5G networks or broadband Internet networks including artificial Intelligence (AI), machine learning, augmented reality, Internet of Things (IoT), autonomous driving, blockchain solutions, cloud solutions etc. Some of these are already globally experiencing growth in the existing networks and all of them are expected to grow substantially in the future. Examples: currently, 5% of global organizations have fully adopted AI, but the penetration is expected to increase rapidly before 2025. IoT with 20.35 billion devices connected in 2017 is estimated to show 75.44 billion devices connected in 2025. The expected growth is based on delivering of new value to businesses and citizens. It is, however, not obvious that this growth will also occur in developing countries. Currently, the digital divide between developing countries and developed countries is widening. This is mostly due to the lack of infrastructure and low level of awareness by the businesses and citizens of the value made possible by the new technologies for developing countries. The book discusses the potentials of the new technologies for developing countries and the need for market interventions that will facilitate the demand and supply side of the market. It is designed for a broad audience including practitioners, researchers, academics, policy makers and industry players and influencers. The language and approach to the handbook is a combination of the academic writing style and professional reviews.